I play Rugby with The Wild Geese, an Old Boys side in the Washington, D.C. area. One of the ongoing points of discussion is why some countries are consistently better at the game than others. 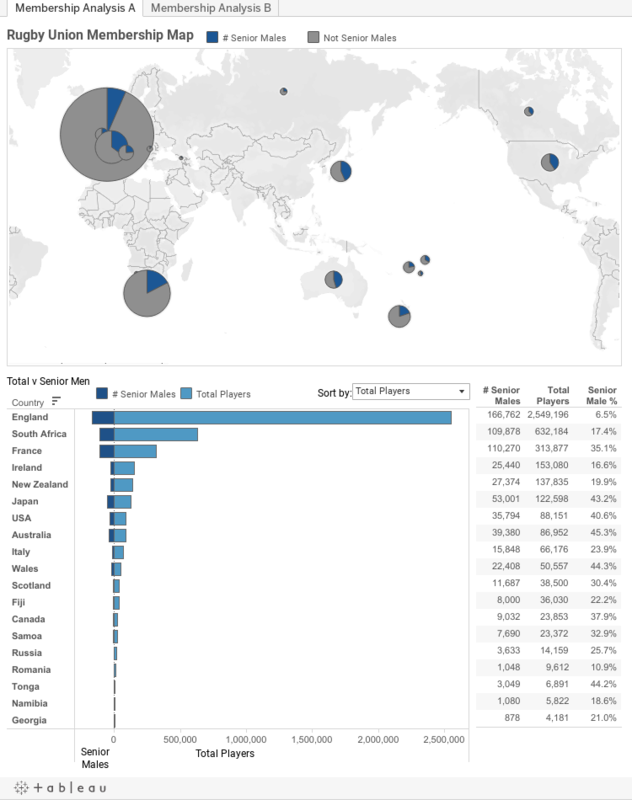 A couple of days ago one of my fellow Geese sent around an image from the international governing body showing the numbers of Rugby players for a number of countries, including the total number of players, the number of senior males, and the % of senior males. The image is included below. This prompted some discussion as to what the numbers in the image mean; it seems that everyone sees support for his or her own theory of national competence. So, just for fun, I recorded the numbers and prepared the following Tableau dashboards, published to Tableau Public. I'm not proposing any particular interpretation (although I have an opinion or two), preferring to let the dashboards trigger their own insights.